NOTE: Most of the descriptions on this site also apply to RPN-65 SD for the iPhone. 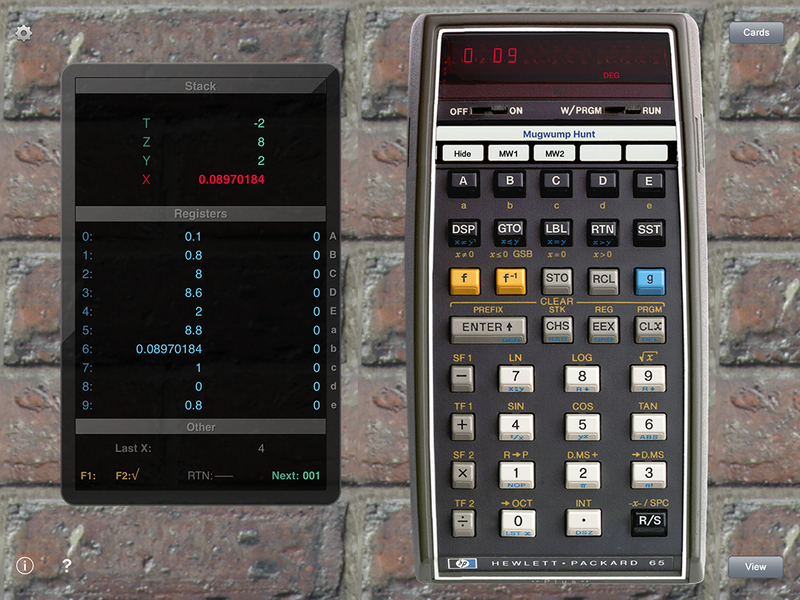 RPN-65 Pro is a photorealistic simulation of the first programmable handheld calculator ever produced. 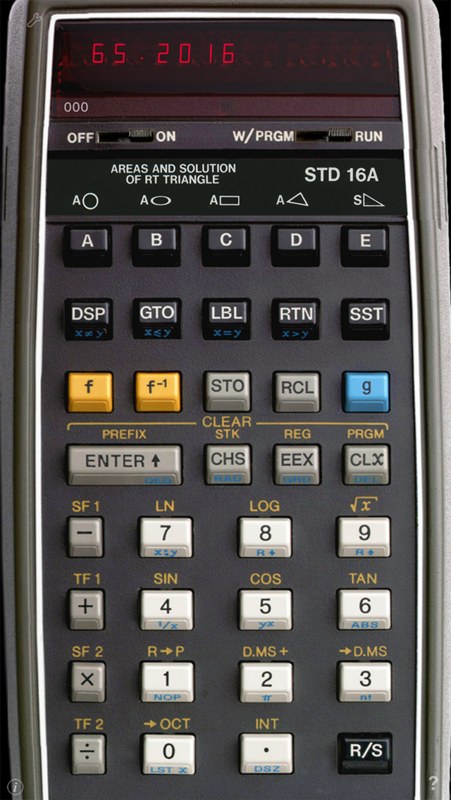 Introduced by Hewlett-Packard in 1974 at a price of $795 (more than $4000 in today's dollars), it was a tremendous success with engineers, scientists and hobbyists. 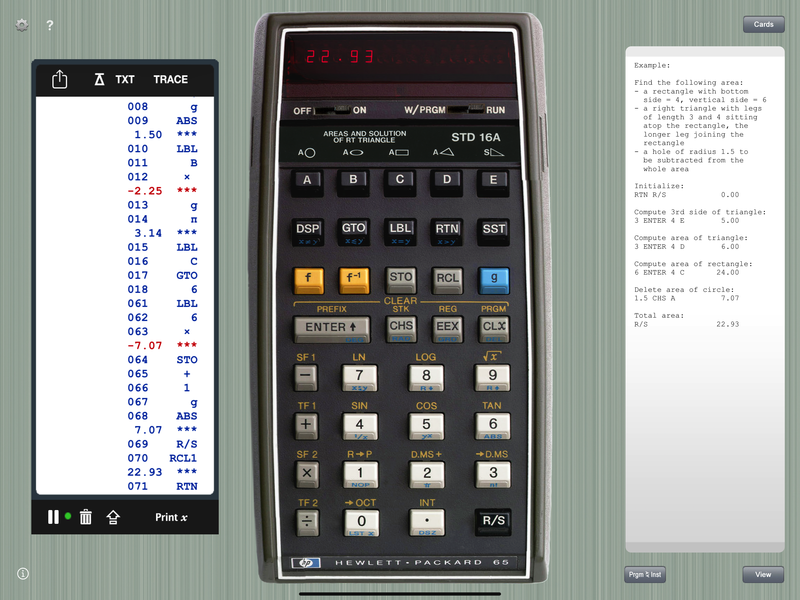 RPN-65 runs virtually all existing HP-65 programs. It sports a powerful program database and an array of import/export options. RPN-65 in Plus mode is the HP-65 you wished you had back in the 70's: more program steps, more registers, more functions, more subroutine levels, much higher speed, comfortable program editing, printing without wasting paper tape, live view of all registers and flags, and a program library at your fingertips. HP Standard Pac, HP E.E. 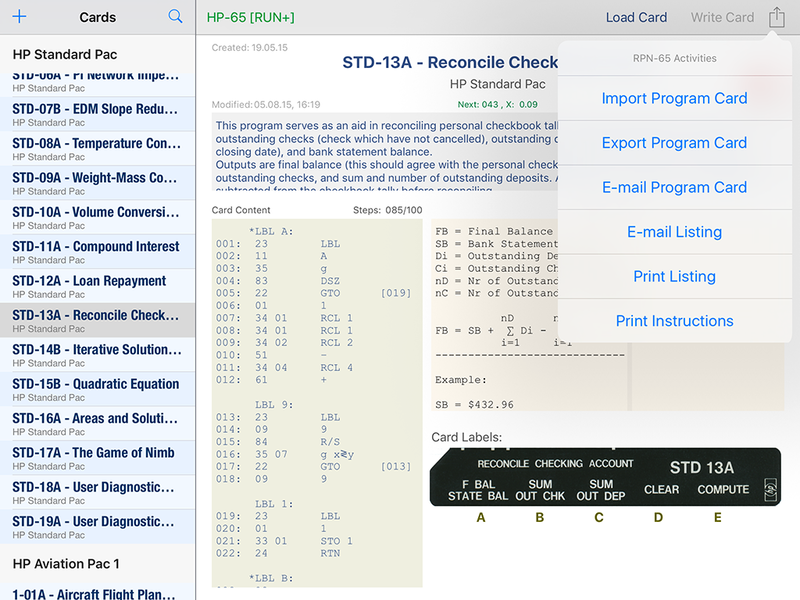 Pac I, HP Math Pac I, HP Math Pac 2, HP Stat Pac I.
RPN-65 comes with these Pacs built in and ready to explore. 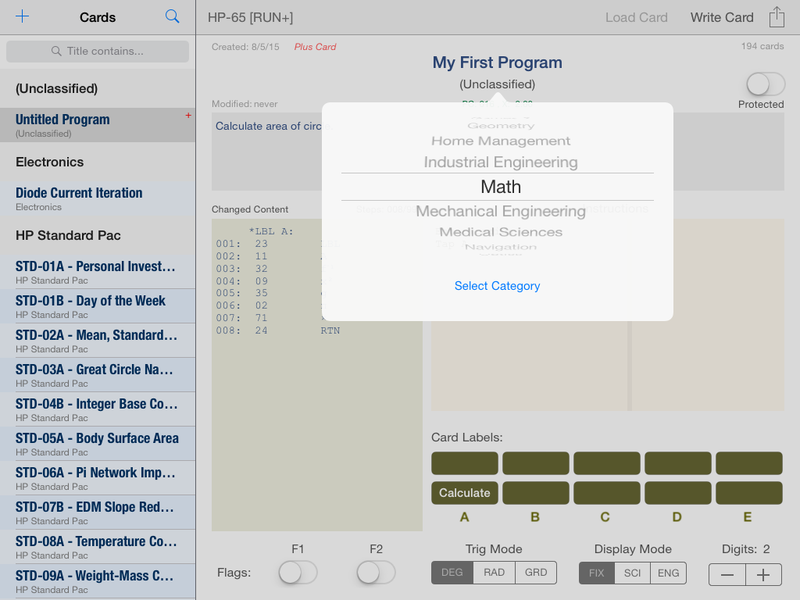 Import/export single program or data cards, or send them by e-mail. Print on a virtual paper tape printer. E-mail the paper tape, or send output to a real printer. Select the ribbon color (black or blue). Print any text on the paper tape. Low-battery warning in the calculator's display when iPad battery charge drops below 10%. In TRACE mode, a message will be printed on the paper tape. 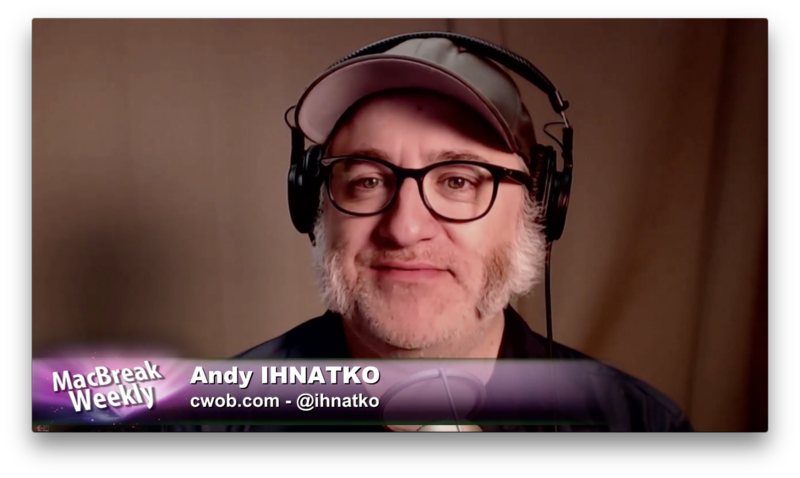 Watch the stack, the memory registers, the program step counter and the flags in real-time. 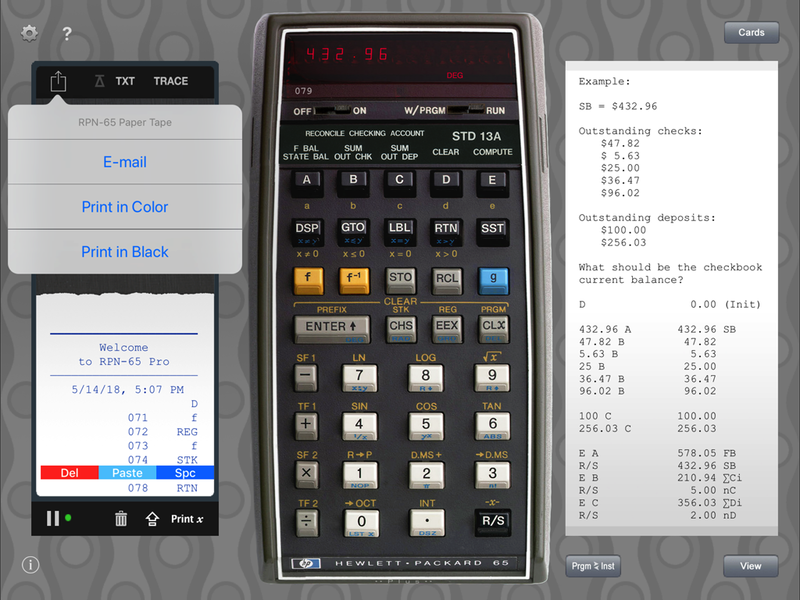 Paste text representations of HP-65 programs right into the calculator and run them. Enter program steps by simply typing commands into the program listing. Program steps shown in plain-text in the display area. Reads data cards created by RPN-65/67/97. RPN-65 SD is the iPhone/iPod version of RPN-65 Pro. Download the program "Diode Current Iteration" shown on pages 10 & 11 for RPN-65 Pro.